It was a Thursday of anticipation, with barbecued pheasant, squab and duck for dinner in Melbourne. I had already missed the previous two asado specials prepared by San Telmo for the Melbourne Food & Wine Festival's winter program. The Roast Collection has more than 100 food and wine events paying tribute to Victoria's seasonal produce. 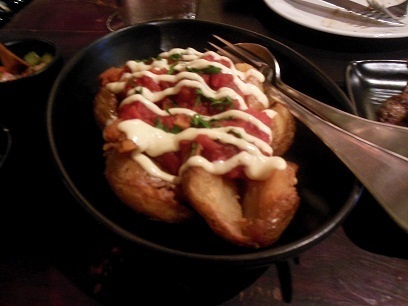 San Telmo is no newcomer to the Melbourne food scene. Named after the oldest barrio (neighborhood) of Buenos Aires, this Argentinean restaurant and wine bar has been serving up meats cooked with the smoky goodness of a charcoal grill. The social element of asado with shared plates is also popular with local diners. I pushed aside the antique wooden doors and arrived into an eating house with counter-top dining, timber tables, leather sofas and shelves upon shelves of wine. The dimly lit dining area decorated with cowhides, old saddles, tins and lamp were reflections of Argentina's traditional gaucho (cowboy) culture that dominated the grassy flat plains of Buenos Aires. The main attraction was the open kitchen with cooks busying on an enormous custom-made parrilla or charcoal grill, which was the birthplace of San Telmo's asado. The place was quiet at 6pm but quickly filled up by 7pm with the buzz of feeding, conversations and explanations of the menu to first-time diners. The kitchen didn't miss a heartbeat with food delivered warm and in a timely fashion. I had already pre-decided on the Asado De Elementos of grilled squab, confit duck leg and pancetta wrapped pheasant ($75), and added an order of chargrilled veal sweetbreads ($20), duck fat roasted potatoes with spiced tomato and lemon aioli ($14), all matched with handcrafted wheat beer from El Bulli restaurant in Barcelona ($19.50). Sweetbreads are usually grilled whole in Argentina. 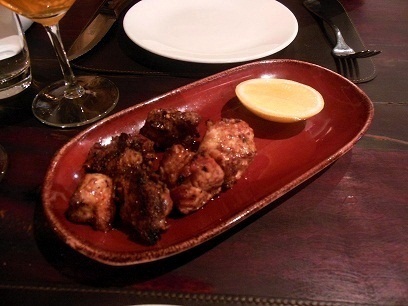 I had crumbed lamb sweetbreads at George's GAZI and was looking forward to San Telmo's grilled veal version. I enjoyed them as a gastronome but they can be a test for an inexperienced kitchen. I was looking for a slightly charred crispy crust that would contrast with the tender and creamy interior. The kitchen delivered deliciously golden crisp chunks of sweetbread. The only regret was the heavy handed salting that unbalanced the flavour of each bite. I'm neutral to potatoes but add duck fat, and the humble root vegetable can take flight into new levels of crunch and flavour. Duck fat allows the potato to achieve a golden crunch without burning and without greasiness. I thoroughly enjoyed the bite-size morsels of soft interiors wrapped by golden-crisp edges that delivered sweet meaty flavours by Michael at Epoca. With the parilla, I was looking forward to crunchy, cracked and smoky duck fat roasted potatoes although this was not an Argentinian dish. Unfortunately I was disappointed. The dish was just potatoes with dense roasted shells covering crumbly insides. The tasty spiced tomato and lemon aioli were distractions to what should have been the main star. The Asado De Elementos was a more hit-than-miss dish. The confit duck leg was representative of the classic dish from southwest France - duck legs marinated in coarse salt, cooked very slowly in duck fat and then rendered crispy in the oven. The cured meat held a heavy salt flavour and pulled apart easily. The pheasant, presented as a roulade with a pancetta wrapping, delivered mouthfuls of light crunchy sinews mixed with tender poultry sweetness. The roasted pancetta exterior kept the pheasant moist and injected a light saltiness that heightened the overall flavours. The combination of cararmalised fatty skin and dark coloured lean meat of the grilled butterflied squab delivered a rich flavour. The meat was moist, tender but undercooked in parts. As squab becomes livery when thoroughly cooked, the best way to enjoy this small poultry is usually grilling to medium rare and then resting before serving. The overall service I received from 2 waiters was cold and indifferent although it warmed up slightly towards the end. Emphasis on the limited amount of dining time available due to double seatings set the mood for dinner. There was impatience with slow and small orders. Replacing the undercooked squab was a brief interview with the food police. Perhaps the dining experience might be vastly different on another day but the pricey-for-average European-Argentinean food served with an attitude will not have me rushing back for more anytime soon.